Our podcast and blog talk a lot about minimalism, and why it’s beneficial to apply its principles to as much of your life as possible - including hobbies. How do we get the biggest positive outcome (health, fun, social connections, personal development) with the least input and cost in other areas of our lives (family time, finances, etc). In this blog post, I’ll cover some specific things that I did to design a minimalist road bike. If you want to learn how to build and spec your own, read on! The complete bike, March 2019. The words “minimal” and “minimalism” get thrown around a lot today, so I’m going to be a bit more nuanced than you’re used to. Many times these terms are used in the context of cycling solely referring to a bike’s appearance. “Man, the cable routing of that bike is super minimal!” Rad… I guess? When I refer to minimalism in cycling, I’m talking about something that requires a minimum of my time, maintenance, and hassle. I started this bike project with one goal in mind: The only maintenance it should require for 364 days per year is pumping the tires and occasionally lubing the chain. That 365th day might include things like replacing the chain, replacing cables and housings, replacing bar tape, or other routine items. The bonus is that - because the bike is built specifically for this purpose, doing all of these things are quick work, and the entire tune-up project could be done in an afternoon. If the bike had internal cables, electronic shifting, hydraulic disc brakes, and other new features, the maintenance intervals would be much more frequent, and each interval would take several times longer. If you want a deeper dive on this topic, listen to Episode 6 and 7 of the podcast. 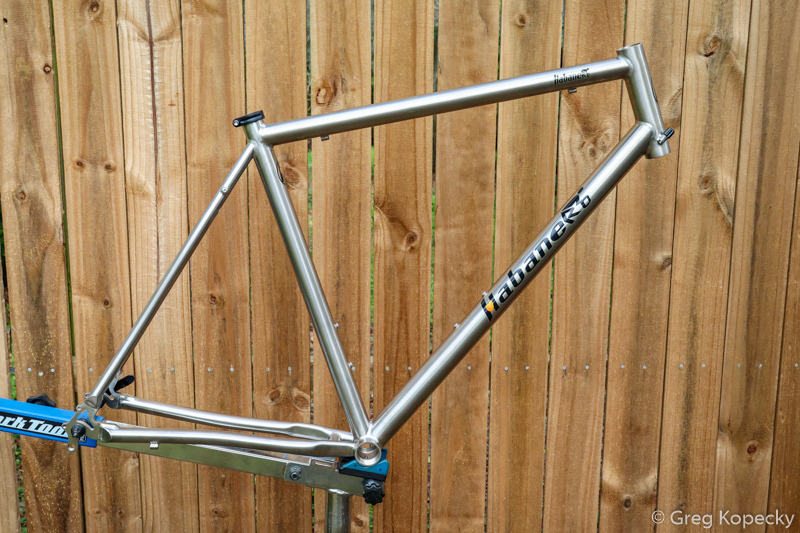 This project started with one frame in mind: Habanero Cycles. Not only are they great bikes, but the business is run by a great human being, Mark Hickey. If you have a question or problem, Mark will handle it. The reason I picked Habanero is simple: they’re the most affordable ($1,000 starting price for a frame! 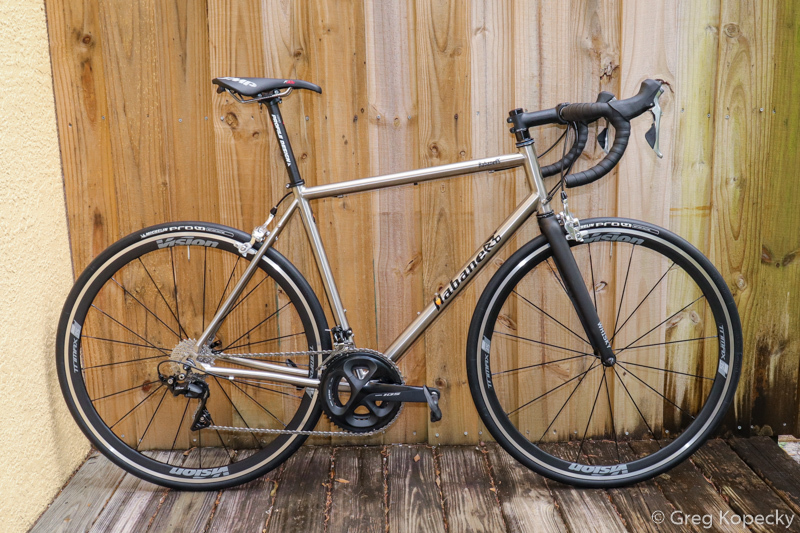 ), highest-quality titanium bikes I’ve ever ridden. I picked titanium because it won’t rust, doesn’t require maintenance, and has a nice ride quality. I’ve owned more expensive titanium frames before, but none have match the detailed quality of Habanero. While it might seem silly, the details are hard to get right. Things like proper clearance of your rear tire, chainrings, crankarms, and rear derailleur. There is NOT a lot of space to go around, and I’ve owned frames where chainrings or cranks hit the frame, tires rub, or front derailleurs are out of whack. I also owned a very fancy ti frame from a major brand that had crooked bottle cage mounts… so my water bottle sat crooked and hit my leg every pedal stroke. Another frame had the bottle mounts drilled in the wrong place, so they had to be cut, welded, and re-drilled elsewhere. The list could go on. I’ve owned several Habanero bikes, and they have had a combined ZERO instances of such issues. They just work. Not pictured: the bottom bracket shell even has a drain hole for water to escape. 1 1/8” head tube. This used to be the standard, but I’d be more “future-proof” if I went with a larger size tube that could fit a 1.5” tapered fork. Simply put, I just don’t like the look, and there are actually more compatible forks for mid-reach brakes that use a straight 1 1/8” steerer anyhow. On to the build specs, which were actually not hard to decide. The latest Shimano 105 R7000 groupset is insanely good - especially given the price. The front derailleur has better tire clearance than the last generation, and overall the groupset is better than top-end Dura Ace from 10-15 years ago. If you want more specifics on it, check out my review over at Slowtwitch. New 105 is so good that I’m actually a little afraid it’ll cannibalize sales from their pricier groupsets. Don’t spend more unless you have a fully-funded 401(k), your house is paid off, and you have cash burning a hole in your pocket. 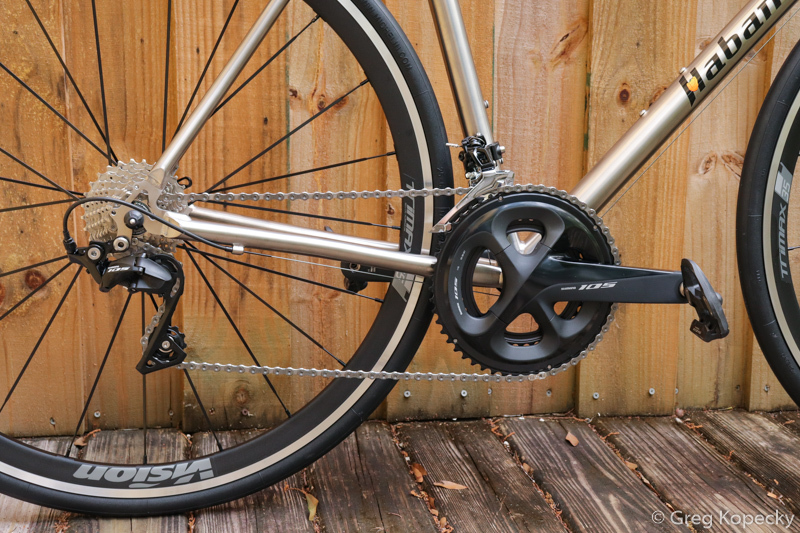 The new derailleur has semi-tricky cable routing, but after you do it once, it becomes easy. Perhaps my biggest departure from the norm is my choice of brakes. Mid-reach calipers used to be somewhat common, and should be the default choice for road bikes. You see, there are short, medium, and long-reach brakes - and this refers to the length of the brake arms. The photo below compares short and mid-reach brakes. Above: Mid reach (left) vs Short reach (right). When the brake arms are longer, the frame manufacturer can move the mounting bolt hole up higher. This moves the caliper away from the tire - giving more tire clearance within the brake. The longer arms allow the brake pads to still reach the rim. With a 28mm tire, there is still plenty of clearance. Since we have an effective small, medium, and large sizing scheme for brakes, it makes sense to have the “medium” (mid-reach) as the industry standard, right? Short and long could be chosen for special use cases. Rather than do this, the marketing is run by fashion and aspirational marketing. Want to feel like a pro, even though you ride nothing like one? Just ride their exact equipment, including the short-reach brakes and limited tire clearance that greatly limit the bike’s capability. As such, short-reach became the standard, despite their lack of versatility. Most frames equipped with short-reach rim brakes only allow for 25mm tires, with a few stretching it to 28mm. Up front: The outstanding Whisky No.7 Mid Reach fork has ample clearance. The recent solution for this problem has been to push disc brakes into road cycling. This isn’t necessarily all bad, but there’s a severe lack of education on the costs of these systems for the average recreational cyclist. Things like fluid change maintenance intervals, cleanliness requirements, different safety concerns and practices, and so on. I’ve written about the topic extensively (yeah, a lot), but the short of it is this: Discs can work great, but you’re always on the hook for more maintenance (and they almost always make more noise than rim brakes). Using mid-reach rim brakes allows me to use 32mm+ tires with zero disc hassle (which actually makes this more of an “all-road” or even “gravel” bike). I should also mention that my favorite mid-reach brake is the outstanding Shimano BR-R650. 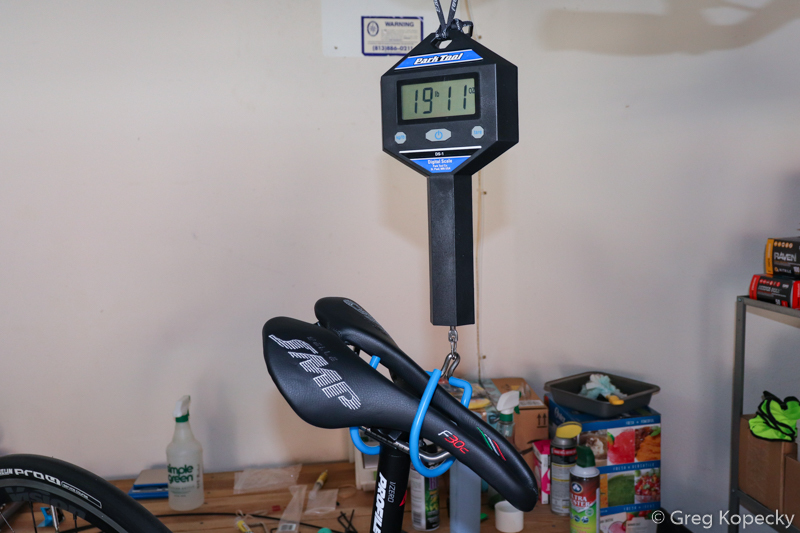 It’s effectively Ultegra-level, and has VERY good feel and solid construction that results in no noise or vibration. I also upgraded mine with Kool Stop dual compound brake pads for all-weather performance and low rim wear. 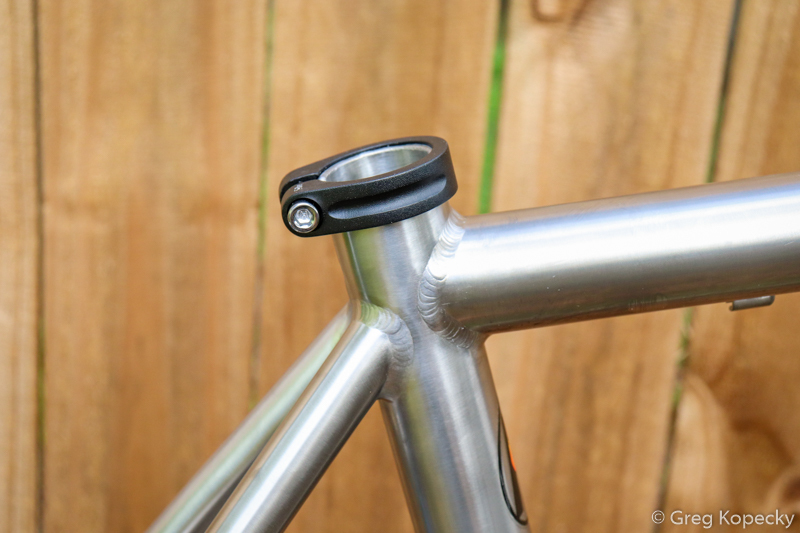 I’m a big fan of the bars from Profile-Design, who have nailed drop bar shape and comfort. I used their DRV/A bar, which is available in multiple widths, and three drop/reach measurements. The shape integrates very well with modern brake hoods, with a smooth transition. The stem is their no-nonsense 1/ZeroSeven, along with a zero setback 1/Zero seat post. The saddle is new to me - the Selle SMP F30 C. I’m a huge fan of SMP, and covered my favorite road saddle over at Bikerumor - the SMP Avant. The F30 C is lighter, flatter, and has less padding, making it appropriate for racers, lightweight folks, or those that just like a firm and flat saddle. While I find the F30 C to be comfortable and my favorite flat-style saddle, I still prefer the shape and additional padding of the Avant. The fork I chose is the outstanding Whisky No.7 Mid Reach. In a world that has nearly abandoned mid-reach brakes, Whisky is one of the very few that still offer a compatible option - and one that’s light and fully-featured to boot. It has tons of tire clearance, and even threaded mounts near the dropouts for fenders. I’m using the Vision Trimax 35 aluminum wheel set. You could argue that I should have picked an old-school, high-spoke-count wheel with traditional looks. I get it, and I’m not against that type of wheel. I wanted to try the Visions as a way to get a bit more performance than a 32-spoke training wheel, without the heavy price tag of a carbon wheel. So far, so good. For tires, I’m using the Michelin Pro 4 Service Course in 700x25mm size. For whatever reason, the sizing of this tire isn’t accurate, and they actually inflate to 27-29mm, depending on how wide your rim is (I’m not complaining - I like wide tires). On my Vision rims, they inflate to just a hair under 28mm. They’re great-riding tires that hit a nice middle-ground of speed and puncture resistance. I’m over the moon about this bike build. I hope it has provided a template for you to build your own minimal road bike, that will allow for maximum ride time and minimal nonsense. With a complete weight (including pedals, but no bottle cages) of 19 pounds and change, it’s very well in the ballpark of acceptable range. Everyone knows the deal - lighter weight just costs more money, and often comes with an invisible price tag of more maintenance. Extra maintenance quickly kills my enthusiasm for actually getting out to ride, so I’m saying: Mission Accomplished.